Integrative oncology is a holistic medical concept for the treatment of cancer, which combines conventional and evidence-based complementary therapies. The aim of this integrative approach is to reduce the side effects of toxic treatments, to improve the quality of life, and prolong the life expectancy of a cancer patient. In addition, an integrative oncology program will enable cancer patients to better cope with their disease and activate their self-healing powers (salutogenesis). Alternative treatment measures or processes are those which are used instead of conventional medicine standards. Alternative treatment methods should therefore only be used if no useful conventional treatment measure is available. However, caution is recommended here as there are many examples of how real chances of a cure are missed by alternative treatments and by dispensing with the standard treatment. Complementary treatments are treatment measures from natural medicine, immunology, molecular biology, biochemistry, physics, and psychology, which are used to supplement conventional therapy. They lie outside the established, conventional standards and do not have the same degree of clinical certainty as the methods of evidence-based medicine. They do, however, display the prerequisites for a clinical trial, often on the basis of empirical observations and scientific basic research. Integrative treatment is the use of conventional therapy in connection with complementary treatment measures, in which it is attempted to combine the treatments conceptually in the interests of the Patient. In the last century cancers have developed into a widespread disease. Seen globally, both the frequency of cancer as well as – to a rather smaller extent – the mortality rates for most types of cancers are increasing. According to the World Cancer Report of the World Health Organization (WHO) the number of new cancer patients around the world annually will increase from around 12 million to approximately 15 million in 2020. It is assumed that in industrial countries today every second man and every third woman will develop cancer. If this development continues, then it can be assumed that in the foreseeable future every person inhabiting the earth will have cancer. In 2005 the cancer-related deaths for the world population was estimated at 7.6 million by the WHO. For the USA this would be around 700,000, for Germany about 250,000 and for Switzerland around 20,000 deaths from cancer in the last year. It is expected that the mortality rates for cancer will increase further. These alarming figures are in no way based on governments being insufficiently prepared to spend money on cancer research and on fighting cancer. For example, from 1971 to today the annual budget of the National Cancer Institute of the USA has increased by a factor of 30, from 150 million to 4.6 billion US dollars. Similar financial efforts are also made by the European Union and other countries. Compared to these enormous sums for fighting cancer, the successes achieved have really remained very small. From this sobering observation it is easy to work out the significance not only for the individual cancer patients but also for society in general. In spite of improved diagnostic and therapeutic options, our modern medical system – including complementary medicine – has so far failed where cancer is concerned. In particular the effect of carcinogenic substances in our environment has been under-estimated and preventive measures have not been sufficiently supported and exploited, which certainly is partly responsible for the constant increase in the frequency of cancer. Furthermore, early diagnosis and therapy have not been improved sufficiently and aftercare within the framework of secondary prophylaxis has often been entirely neglected. Our hope of conquering the cancer problem by constantly improving tumour-destroying treatment methods such as surgery, chemotherapy and radiotherapy has not come to fruition for the advanced stages of the main types of cancer – lung, breast, bowel, and prostate cancer. These treatment methods, even in connection with the ever more frequently used complementary oncological measures, were unable to achieve any decisive reduction in mortality from cancer in the last decade. In the USA, age-corrected cancer mortality even rose from 1970 to 1995 by around 6% and has only reached a plateau in the last few years. Only for men was there a slight reduction in cancer mortality of around 1%, which was probably caused by a reduction in smoking. The ratios are similar in Germany and Switzerland. The number of new cases of the disease per year is continuing to rise in both countries, while the number of deaths from cancer in Germany has fallen slightly and in Switzerland it has increased slightly. The figures published by the Association of Population-based Cancer Registries in Germany and the Robert Koch Institute reflect the sobering truth in cancer medicine, which is not mitigated by the successes and breakthroughs in the fight against cancer which are praised almost daily in the media. The overall effect of cancer medicine today – both conventional and complementary – on cancer mortality can therefore be assessed as being disappointingly small. Clearly cancer medicine needs new impulses. A rethinking with regards to the importance of preventive measures for reducing the incidence of cancer and mortality has to be the most important consideration. In particular the effect of carcinogenic substances in our environment should be re-assessed and the concentration of such substances reduced by suitable means. We must eat more healthily and convert basic dietary and physiological knowledge into our daily routines, starting with how we feed our babies, and including school meals, hospital food, and nutrition in old people’s homes. Healthier lifestyles must be encouraged, and in particular we must achieve a further reduction in alcohol consumption and smoking. More research money must be spent on general cancer prophylaxis, even if it is not conducive to business or academic careers. Furthermore, improved early diagnosis and more effective treatment options must be made available to a broader group of patients, and cancer aftercare as part of targeted secondary prophylaxis, including complementary medicine options, should be reoriented. <5% for brain tumours, cancers of the stomach, lung, oesophagus, liver, and pancreas. Altogether around 50% of all cancer patients can be cured today: every fourth by surgical procedures, every eighth by radiotherapy and only every twentieth by chemotherapy. A ‘cure’ is defined as surviving for five years without a relapse. The currently available chemotherapeutics have indeed been able to bring significant treatment successes in the case of a number of rare types of tumours such as lymphomas, leukaemia’s, and testicular cancer, with cure rates of between 60% and 80%, but altogether the frequent types of cancer, such as cancers of the bowel, lung, breast, bladder, kidney, stomach, bile ducts, pancreas, and sarcomas have only slightly improved overall. Patients in the advanced stage of cancer (around half of all cancer patients) have even less benefit to expect from chemotherapy unless the palliative or symptom-related chemotherapy contributes to a temporary improvement in the quality of life or control of the tumour-related pain or other tumour symptoms. It has been estimated that less than 2% of such patients could still expect to be cured and only around 20% could expect to have their lives prolonged, but this is in any case often only measured in weeks or months. Under these conditions it is inexplicable that cancer patients, even at a very advanced stage and with a short life expectancy, still undergo cytostatic chemotherapy. This very often occurs out of helplessness and desperation on the part of the therapist and the patient equally, who still want to do something in a situation of this kind. Unfortunately, however, this is also due to a lack of knowledge or false information regarding the efficacy limits of cytostatic second, third or even fourth-line chemotherapy for life extension. However, most complementary cancer treatments, to which patients increasingly turn at the end stage of their disease, also have just as little foundation in terms of the prolongation of life in this situation. For most patients the tumour-destroying treatments with chemotherapy and radiotherapy bring significant side-effects, immediate and often reversible (e.g. hair loss, immune suppression, inflammation of the mucosa with ulceration) as well as long-term (e.g. chronic weakness, fatigue syndrome, persistent neurotoxicity or cardiotoxicity, and secondary tumours). From the point of view of the cancer patient, therefore, the search for alternative or complementary treatment measures is easily understandable. Up to 80% of all cancer patients also turn to complementary treatment methods in addition to conventional therapy. There is a whole range of different motivations for turning to treatment measures which are practised beyond established, conventional standards. The most important reason appears to be the unchanged existential threat that 50% of cancer patients still die from their disease and modern conventional medicine has not been able to change this significantly over decades. Almost everyone has a relative or friend who has been diagnosed with cancer. The word chemotherapy frightens people and those affected know the suffering associated with it. In spite of the advances in supportive therapy to reduce the side-effects of chemotherapy, this is often considered to be worse than the disease itself. Against this background, it is understandable that patients and their relatives are seeking additional treatment measures in a targeted way with the hope of increasing the chance of survival, reducing onerous side-effects during or after the completion of the standard treatment, counteracting treatment-induced or disease-associated immune suppression, and to be able to reduce depression and anxiety states. Many cancer patients also feel that they are alone and anonymous in the industrialized medicine of our teaching hospitals, out-patients’ clinics and practices, in which doctors and nurses, rushed by the demands of time, are unable to provide the personal and necessary and also time-consuming contact. The patients therefore prefer the frequently private atmosphere and personal attention which they experience in a complementary medicine establishment – even if this leads to an additional financial burden. In the past 25 years, oncology has developed into a very multidisciplinary medical discipline, the future of which depends to a very particular extent on the willingness to work in an interdisciplinary and integrative way. To date, complementary treatment concepts have been regarded as ‘unproven and ineffective’ by conventional oncologists and were therefore either rejected out of hand or at best tolerated. Only very rarely were such oncologists prepared to actually consider complementary treatment methods objectively and open-mindedly, or at least to go along with the patients seeking help. On account of this, many patients were and continue to be unnecessarily exposed to a conflict situation, which often ends in complementary treatment methods not being mentioned by conventional oncologists. This situation appears to be paradoxical as, in the palliative situation, scientifically-founded conventional medicine cannot change the ultimate course of cancer in spite of some successes with tumour-destroying chemotherapy or radiotherapy. The side-effects of these treatment methods often cause more damage than benefit. In some cases they can even shorten the patient’s life expectancy considerably, e.g. if death is caused by extreme toxicity due to the treatment. On the other hand the representatives of complementary oncological practice are often biased and categorically refuse conventional treatment methods uncritically compared with their own methods. Such attitudes are as unjustified as they are dangerous and need to be corrected urgently. 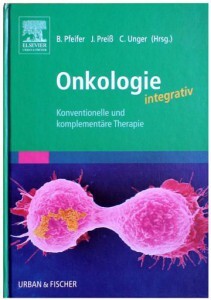 Oncologists and doctors working on complementary oncology must ensure that they examine their own methods critically and recognize the lack of proof of both tumour-destroying and complementary medical treatment methods in relation to extending the patient’s life expectancy in certain treatment situations, and draw conclusions from this. Our health policy, our university training and our medical practice must be free of the profit-oriented pressure of personal or even industrial interests. Only in this way can we avoid unnecessary and expensive chemotherapy as well as unproven complementary oncology measures. Our treatment concepts must take account of the knowledge that, in the vast majority of cases, cancer is to be regarded as a systemic disease and therefore makes a systemic tumour treatment necessary for most patients at a certain point during the course of the disease. In addition the systemic treatment of cancer has become very complicated, as ever more cytotoxic and selectively-active cytostatic substances, the most varied immune therapy approaches, angiogenesis-inhibitors, and a multitude of complementary and alternative treatment paths have become available, and the enormous problem of cost is to be taken into account to an ever increasing extent. In addition to this, cancer is a disease which affects body and soul equally and doubtless requires holistic care and an integrative treatment strategy. We are delighted to be able to offer you the opportunity to watch Professor Ben Pfeifer’s excellent camexpo 2015 keynote seminar “Integrative Oncological Treatments for Patients with Metastaic Prostate Cancer”.